Bar Tabs allow your customers to accumulate items on a temporary account and pay for them at the end of the night before they leave in one transaction. Great for regular clients, functions and large groups sharing a common area. Bar Tabs can be accessed by using the Bar Tab Code, Magnetic Swipe, Search Customer List or Scan Code. 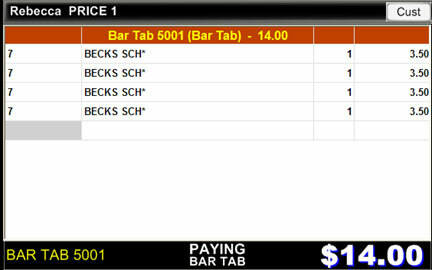 Any Bar and Kitchen printing features will identify the Bar Tab by name.